For generations the Apaches resisted white colonization of their homeland in the Southwest (presently New Mexico and Arizona) by both Spaniards and North Americans. In 1848, when gold was discovered in California, the Apaches were further threatened by incursions of white fortune-seekers on their way to the gold fields. In an incident at a mining camp, Mangas Coloradas, chief of the Mimbreño Chiricahua, was whipped, an act that resulted in his life-long enmity against white men. Though his son-in-law Cochise had long resisted fighting Americans, in 1861 he too, was betrayed by white men and turned against them. Together, Mangas Coloradas and Cochise ravaged much of southern New Mexico and Arizona, until Mangas was wounded in 1862, then captured and killed in January of 1863, allegedly while trying to escape from Fort McLane, New Mexico. Upon the death of his uncle, Cochise became principal chief of the Apaches. More on Mangas Coloradas. In the ensuing struggle, soldiers killed one Apache and subdued four others, but Cochise, suffering three bullet wounds, escaped by cutting through the side of a tent. He soon abducted a number of whites to exchange for the Apache captives, but Bascom retaliated by hanging six Apaches, including relatives of Cochise. This sequence of events is usually referred to as "The Bascom Affair." Avenging these deaths, Cochise took to the warpath with his uncle, Mangas Coloradas. 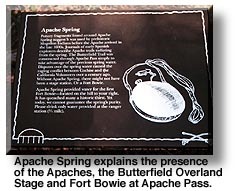 During the following year, warfare by Apache bands was so fierce that troops, settlers and traders all withdrew from the region. 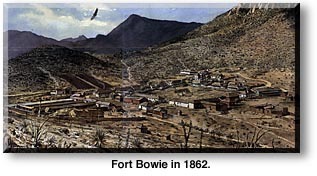 And upon the recall of army forces to fight in the U.S. Civil War in 1861, Arizona was practically abandoned to the Apaches. In 1862, an army of 3,000 California volunteers under Gen. James Carleton marched to Apache Pass to prevent Confederate attacks and put the Apaches to flight with their howitzers. Although Mangas Coloradas was captured and killed the following year, Cochise and 200 followers eluded capture for more than 10 years by hiding out in the Dragoon Mountains of Arizona, from which they continued their raids, always fading back into their mountain strongholds. In 1871, command of the Department of Arizona was assumed by Gen. George Crook, who succeeded in winning the allegiance of a number of Apaches as scouts and bringing many others onto reservations. Cochise surrendered in September, but, resisting the transfer of his people to the Tularosa Reservation in New Mexico, escaped in the spring of 1872. He surrendered again when the Chiricahua Reservation was established that summer, and there he died June 8, 1874. Today, the southeastern most county of Arizona bears his name; it includes Tombstone, Douglas and Bisbee, the county seat. More on Cochise. Geronimo, a Bedonkohe Apache leader of the Chiricahua Apache, led his people's defense of their homeland against the U.S. military after the death of Cochise. In the early 1870s, Lieutenant Colonel George F. Crook, commander of the Department of Arizona, had succeeded in establishing relative peace in the territory. The management of his successors, however, was disastrous. In 1874, some 4,000 Apaches were forcibly moved by U.S. authorities to a reservation at San Carlos, a barren wasteland in east-central Arizona. Deprived of traditional tribal rights, short on rations and homesick, they revolted. 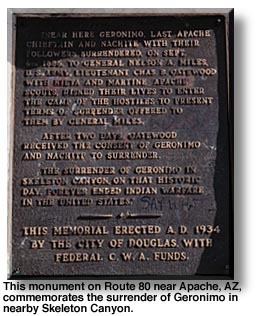 Spurred by Geronimo, hundreds of Apaches left the reservation to resume their war against the whites. In 1882, Crook was recalled to Arizona to conduct a campaign against the Apaches. Geronimo surrendered in January 1884, but took flight from the San Carlos reservation in May 1885, accompanied by 35 men, 8 boys and 101 women. Crook, along with scouts Al Sieber, Tom Horn and Mickey Free (the white child Cochise was falsely accused of abducting) set out in pursuit, and 10 months later, on March 27, 1886, Geronimo surrendered at Cañon de Los Embudos in Sonora, Mexico. Near the border, however, fearing that they would be murdered once they crossed into U.S. territory, Geronimo and a small band bolted. As a result, Brigadier General Nelson A. Miles replaced Crook as commander on April 2. During this final campaign, at least 5,000 white soldiers and 500 Indian auxiliaries were employed at various times in the capture of Geronimo's small band. Five months and 1,645 miles later, Geronimo was tracked to his camp in Mexico's Sonora mountains. At a conference on Sept. 3, 1886, at Skeleton Canyon in Arizona, Miles induced Geronimo to surrender once again, promising him that, after an indefinite exile in Florida, he and his followers would be permitted to return to Arizona. The promise was never kept. Geronimo and his fellow prisoners were put to hard labor, and it was May 1887 before he saw his family. Moved to Fort Sill in the Oklahoma Territory in 1894, he at first attempted to "take the white man's road." He farmed and joined the Dutch Reformed Church, which expelled him because of his inability to resist gambling. He never saw Arizona again, but by special permission of the War Department, he was allowed to sell photographs of himself and his handiwork at expositions. Before he died at Fort Sill, Oklahoma, Feb. 17, 1909, he dictated to S.S. Barrett his autobiography, "Geronimo: His Own Story." 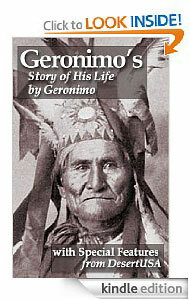 For more details see Geronimo's Last Hurrah.